I’d like to start meeting the other businesses that will be attending the show. Our technology platform will allow our exhibitors access to business listings to encourage lead generation before the show even starts. Through an online business directory on the website attendees and exhibitors will have full access to business contact information, lead forms and services offered by our exhibitors throughout the year. What Will Be Available for Exhibitors? Exhibitors will be able to talk to thousands of attendees about their products and services. Our virtual lead system offer exhibitors a list of people who they can follow up with after the Show. If an attendee would like to learn more about a particular exhibitor, they simply present their card to be scanned by the vendor.The attendee card’s information—including name, title, email, and company—will be downloaded into a system that exhibitors can view online. At the end of the Pittsburgh Business Show, each exhibitor will have a list of names and numbers to contact and to provide more information on their products or services. 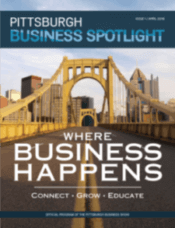 Why Should I Be a Exhibitor of the Pittsburgh Business Show? Being an exhibitor in the Pittsburgh Business Show has a lot of great opportunities. It allows you to be one of five unique exhibitors in your category, plus the opportunity to be one of the only sponsors per category. As an exhibitor you have the opportunity to meet with the attendance at your booth and utilize our app and technology to gather leads with the businesses and professionals you meet. You also have the opportunity to meet with other exhibitors and participants and speakers at the show, to partner and build relationships and have the potential to connect with new clients. You also receive additional marketing throughout the year through the Pittsburgh Business Show website and app. Plus much more. Will You Limit the Number of Exhibitors at the Pittsburgh Business Show? Yes, some industries will be limited. The best way to ensure that your company is represented at the Show is to sign up as soon as possible. I’m not a business owner or executive. Should I still attend? Yes! This show is for anyone involved in a business such as company owners, executives, and entrepreneurs for businesses of any size. It’s also for those who are interested in starting a business or for those who would like to make valuable business connections. The Pittsburgh Business Show is an easy way to meet others who share your same goals—meet more people, increase referral traffic, and drive revenue. The 2018 Pittsburgh Business Show will connect businesses, people and resources so that businesses can meet their goals and increase their revenue. In addition to meeting and engaging with others, business owners will learn how to better their business, understand how to set goals, and discover new techniques and processes. We invite all business owners to also send their employees to listen to the seminars and workshops. Your managers and the key people in your organization should attend. Will there be speakers and workshops? Yes, there will be a lineup of speakers and workshops which will educate and promote the growth and leadership both individually and in a company setting. The Pittsburgh Business Show speakers will provide an opportunity for business owners, employees and professionals to learn and grow from some of the most respected leaders in their industries. Can I speak at the Pittsburgh Business Show too? Yes, we encourage our sponsors to speak at the show. This is the perfect opportunity to talk about new products or services. Last year, some of our sponsors also talked about their business philosophy and how their strategies have developed over the year to reach and retain customers. Yes, our media kit is available by filling out a contact us form and one of our team will send it over! You can also give us a call at 412-668-4990. How will my company’s sponsorship be supported by the Pittsburgh Business Show? Being an active sponsor for the current year and in future Shows can ensure that you build a ongoing name recognition and lead source to count on year after year to bring in new opportunities to your business. Custom Sponsorship opportunities are available. Why should I sponsor the Pittsburgh Business Show? Sponsorship opportunities with the Show allow for several areas of marketing and media. This recognition and long-lasting reach of our marketing will help you build your name recognition and company brand. Marketing includes press releases, videos, billboards, television, and other media that you can be displayed on and recognized as a sponsor of the Pittsburgh Business Show. How can I use this opportunity as a promotional tool for my company? Being a speaker at the Pittsburgh Business Show offers business leaders a way to increase their visibility and company’s prominence while promoting community involvement. Speakers will also be showcasing their products and services while connecting with business owners and decision makers around Pittsburgh. You’ll attract more business leaders to your exhibitor booth while you create awareness and sales for your brand. We also encourage our speakers to share and promote their workshop or speaker session prior to the Pittsburgh Business Show. How do I contact someone about being a speaker for the Pittsburgh Business Show? Fill out our contact page or call us at 412-668-4990. What kind of topics do speakers talk about? Our presenters speak about a wide range of topics. Last year, our attendees learned about business banking options, website design and SEO, workforce management, and job coaching, plus how to run successful business boot camps, promoting your business online using Google, growing your business through digital marketing, how to start a business, and how to connect with Millennials in the workplace. This year, we hope to have speakers who will talk about creating a sales funnel, the future of retail management, new technology to simplify CRM, human resources issues, how to attain capital to expand your business, what tools you need to grow your e-commerce company, and how to capitalize on the changing oil and gas industry. If you have an idea about a speaker presentation, we’d love to hear it. Why should I be a speaker at the Pittsburgh Business Show? We’re looking for industry experts who want to share what they have learned from being successful business leaders, executives, and entrepreneurs. You’ll be able to get in front of thousands of people who want to hear your success stories and who want to work with you to grow their company.